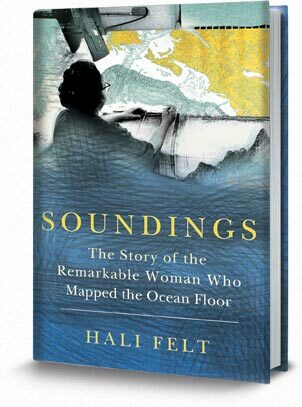 Soundings is the story of the enigmatic, unknown woman behind one of the greatest achievements of the 20th century. Before Marie Tharp, geologist and gifted draftsperson, the whole world, including most of the scientific community, thought the ocean floor was a vast expanse of nothingness. In 1948, at age 28, Marie walked into the newly formed geophysical lab at Columbia University and practically demanded a job. The scientists at the lab were all male; the women who worked there were relegated to secretary or assistant. Through sheer willpower and obstinacy, Marie was given the job of interpreting the soundings (records of sonar pings measuring the ocean’s depths) brought back from the ocean-going expeditions of her male colleagues. The marriage of artistry and science behind her analysis of this dry data gave birth to a major work: the first comprehensive map of the ocean floor, which laid the groundwork for proving the then-controversial theory of continental drift. When combined, Marie’s scientific knowledge, her eye for detail and her skill as an artist revealed not a vast empty plane, but an entire world of mountains and volcanoes, ridges and rifts, and a gateway to the past that allowed scientists the means to imagine how the continents and the oceans had been created over time. Je viens de vérifier dans mes cours de première année de géographie physique assurés par Etienne Moisssenet et ALain Godard, Marie Tharp est mentionnée une dizaine de fois dans le cours, comme étant à l’origine de la cartographie des fonds marins. Elle a été oubliée par la société, mais pas par certains géographes physiciens apparemment.